Vall de Núria is a stunning mountain valley standing almost 2000m above sea level, located in the Pyrenees in the province of Girona (Catalonia), at 120km from Barcelona and surrounded by 3000m high mountains. 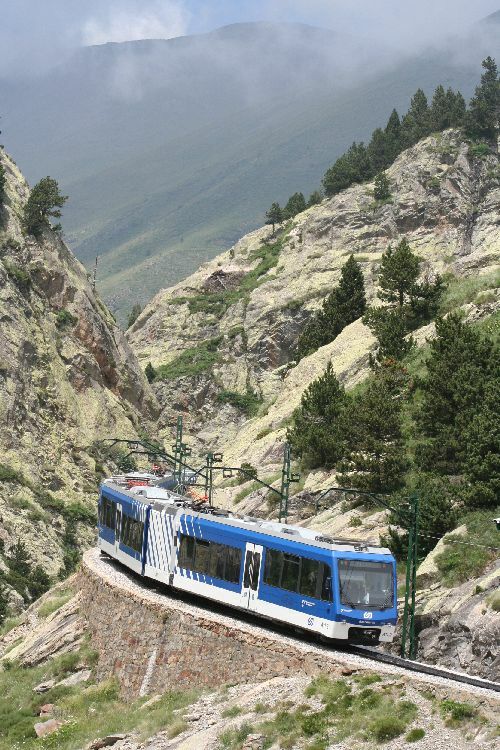 Closed to traffic, it is only accessible by a special mountain train, called "cremallera", leaving from Ribes de Freser, a small village in the Catalan Pyrenees. The "cremallera" train station of Ribes de Freser is located here. By train, it takes around 2h15 from Barcelona, with a direct connection. The train station of Ribes de Freser is located right beside the "cremallera" train station, namely here. By car, it takes around 1h30 from Barcelona, or 2h from Perpignan, with roads in good shape. If you come by car, you can park it for free here, within a short walk from the "cremallera" train station (the pictures in googlemaps are not updated, this location is indeed a parking now). If you arrive by plane at Barcelona, the easiest way to catch the train is the take the aerobus (5.90€) from any of the two terminals of the airport until Plaça Catalunya (last stop), and then take the train at Plaça Catalunya until Ribes de Freser. Yo do not need to book the aerobus tickets in advance, it leaves every 5 minutes and it hardly gets full. The train schedules from Barcelona (from "Sants" or "Plaça Catalunya" stations) to Ribes the Freser, and back, can be checked here. The tickets must be bought directly at the train station before the departure time. Don't worry, they will not run out of places. The "cremallera" train schedules from Ribes the Freser (Ribes-enllaç station) to Núria, and back, can be checked here (the trip takes 40 minutes). The "cremallera" tickets are included in the registration fee, you will just have to show the registration confirmation to WG 2019. They will also probably have a list with your name on it. IMPORTANT: we have organized a special "cremallera" train for the participants of WG 2019, leaving on Tuesday June 18th at 19h30 from Ribes de Freser to Núria, so that the participants can take the train from Barcelona to Ribes de Freser that arrives at 19h15. If the train has some delay, the "cremallera" will wait. Copyright © 2019, WG 2019.